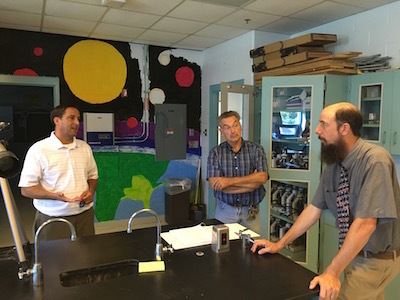 On a recent trip to Peoria, Illinois I stopped in to check on the panels at the Peoria Academy. 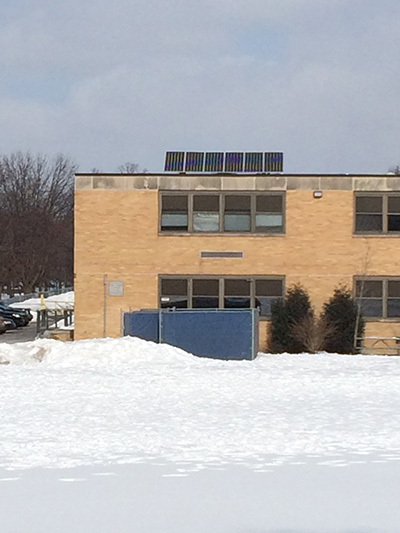 I love the way that Peoria Academy put their solar panels on their Outdoor Education Center. The visibility is huge because it is in the back of the school and so visible from most classrooms. 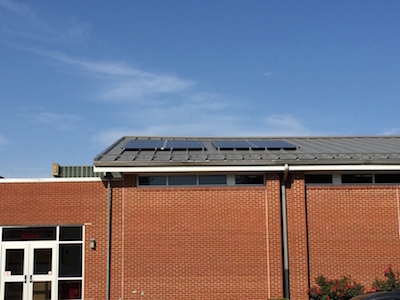 Plus as students go to their soccer field or to the Education Center the panels are clearly visible. 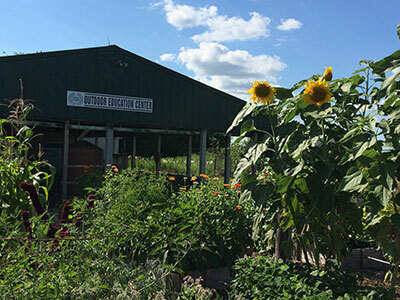 The Outdoor Education Center also has a fantastic garden with lots of “sunflowers” growing and somehow that seems like the right flower to be near their solar panels. 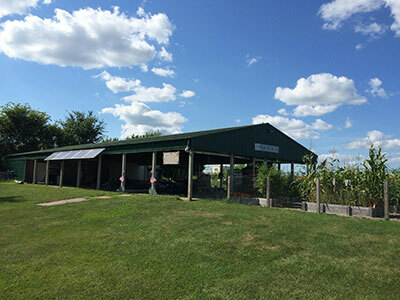 Wanxiang America Corporation is a solar manufacturer with a manufacturing facility in Rockford, Illinois. 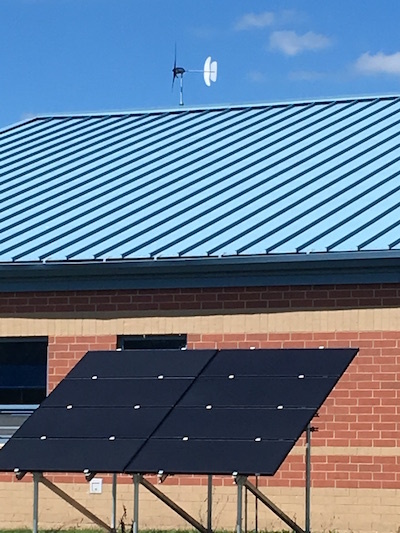 Some of the Illinois Solar School projects have solar panels manufactured in Rockford, Illinois. 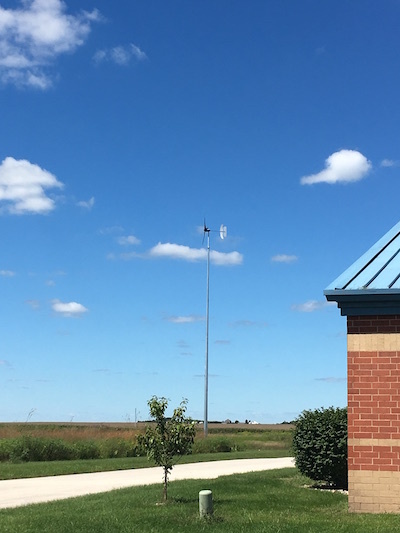 Wanxiang’s headquarters is in Elgin, Illinois. 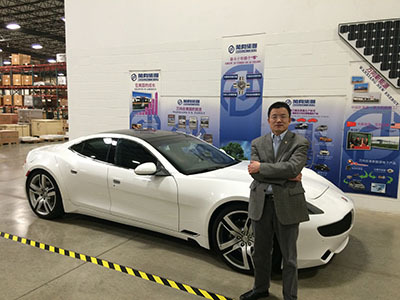 When I visited Wanxiang Project Manager Daniel Li recently he told me that Wanxiang had bought the Fisker Karma luxury electric plug-in hybrid car and that Wanxiang would start manufacturing the vehicles. 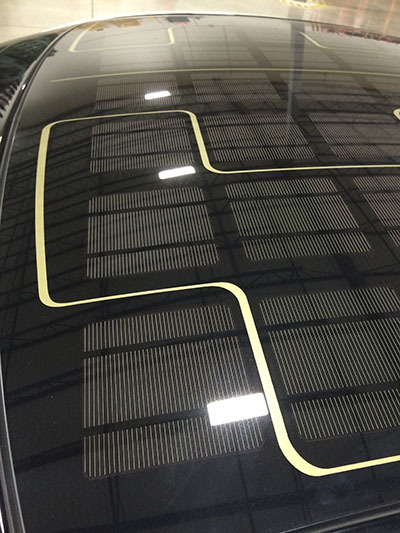 What I found most interesting is that the top of the car is the world’s largest single piece solar glass roof panel. 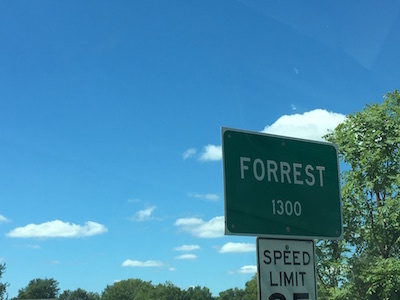 I did not drive the car but I did sit inside it and it is really a cool car. If anyone would like to see it and you are near Elgin, I would call Daniel and ask him if you can take a look. I would love for the car to visit a school or two in the area so that the students can see the solar panel on the roof of the car. It was also named the 2009 Time Machine “Green Design 100 Award” and in 2011 Time Magazine named the car one of the 50 Best Inventions. 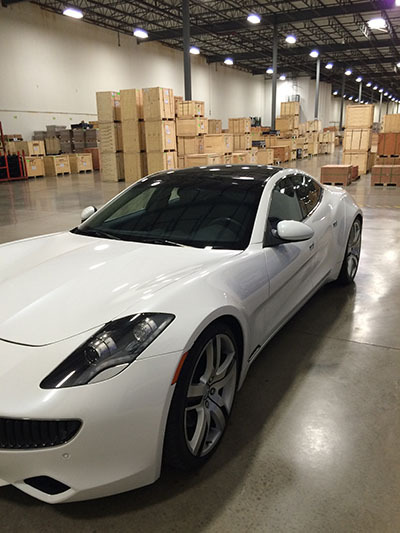 In 2012 Auto Motor and Sport Magazine named the Karma the “Environmental Car of the Year” and Esquire Magazine named it “Most Gorgeous Debut of the Year” and finally Automobile Magazine gave it the “Design of the Year” Award. 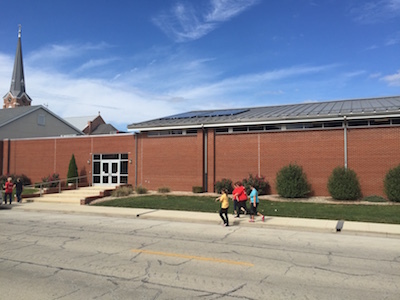 For Illinois Solar Schools the goal is visibility for the students. 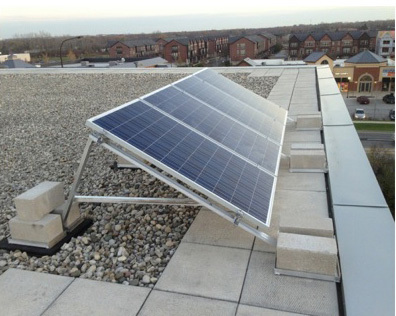 This is an “edge of the roof” style installation that provides both visibility and safety for the solar panels. It also takes up no ground space on the school’s campus. 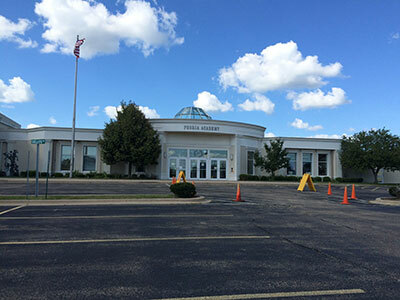 This is the Hawthorn Townline/Dual Language School in Vernon Hills, Illinois. Lisa Ceraulli is our primary contact there. For more information, visit our website. When you hear about solar electricity, most people think about the solar panels. And there will always be solar panels. But if you follow the wires leading from the solar panel they almost always lead to an inverter. 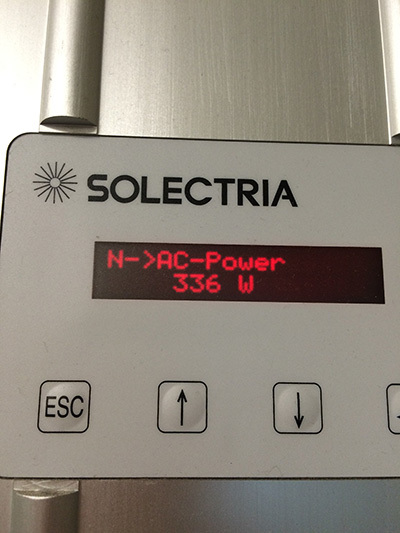 The inverter in this pix is a Solectria brand inverter. The inverter converts the DC (Direct Current) electricity (like that runs into your car battery to power your car radio and air conditioning and your lights and power windows) to AC (Alternating Current) electricity (think the electricity that powers your television and the lights in your classroom). If the switch is from DC to AC, it goes through an inverter and the pix shows an inverter. If the switch is from AC to DC, it goes through a rectifier. And DC electricity is something most of you use all of the time even if you are not in a car. Your lap top and your cell phone (when it is not connected to an AC outlet) are powered by DC electricity that is stored in a battery. You plug into an outlet where AC electricity flows through the wire to a small rectifier that converts that AC electricity into the DC electricity needed to power the laptop or cell phone battery. Most devices use AC adapters that allow you to power the device on AC power but also charge the battery inside the device on DC power. Basically your cell phone and most laptops run on both AC and DC power. So in many portable devices you use every day, these inverters or rectifiers switch either AC electricity to DC electricity or DC electricity to AC electricity depending on the device you want to use and how you are using it and in many of our most popular devices like cell phones and laptops they run on AC or DC power depending on whether it is plugged into an AC outlet or not. Companies that sell these products want you to find them easy to use so they make the devices useable in any situation. (I am not saying you will be able to get cell service but your device will have power.) And some things we are starting to see a lot these days are electric car chargers. To charge an electric car you typically plug into a DC charger. This takes DC power directly into your car battery without the need to convert the DC power to AC power because batteries run on DC power. If you plug in your electric car to an AC outlet (and many cars now can), then you need a rectifier in your car to switch that AC power from your outlet to DC and the more recent electric cars are (like your cell phone) able to be charged by DC power (quickly and more efficiently) or by AC power (it takes longer because the AC power has to be rectified back to DC power when it gets into the car and some electricity gets lost in the conversion.